"Delaware Indians" and "Delaware people" redirect here. For other Native American peoples from present-day Delaware, see Category:Native American tribes in Delaware. For individual people from the state of Delaware, see List of people from Delaware. For other uses, see Lenape (disambiguation). The Lenape (English: /ləˈnɑːpi/ or /ˈlɛnəpi/), also called the Leni Lenape, Lenni Lenape and Delaware people, are an indigenous people of the Northeastern Woodlands, who live in Canada and the United States. 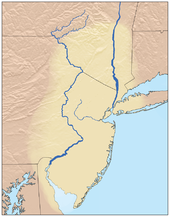 Their historical territory included present-day New Jersey and eastern Pennsylvania along the Delaware River watershed, New York City, western Long Island, and the Lower Hudson Valley. [notes 1] Today, Lenape people belong to the Delaware Nation and Delaware Tribe of Indians in Oklahoma; the Stockbridge-Munsee Community in Wisconsin; and the Munsee-Delaware Nation, Moravian of the Thames First Nation, and Delaware of Six Nations in Ontario. The Lenape have a matrilineal clan system and historically were matrilocal. During the decades of the 18th century, most Lenape were pushed out of their homeland by expanding European colonies. Their dire situation was exacerbated by losses from intertribal conflicts. The divisions and troubles of the American Revolutionary War and United States' independence pushed them farther west. In the 1860s, the United States government sent most Lenape remaining in the eastern United States to the Indian Territory (present-day Oklahoma and surrounding territory) under the Indian removal policy. In the 21st century, most Lenape now reside in Oklahoma, with some communities living also in Wisconsin and Ontario. The name Lenni Lenape, also Leni Lenape and Lenni Lenapi, comes from their autonym, Lenni, which may mean "genuine, pure, real, original," and Lenape, meaning "Indian" or "man" (cf. Anishinaabe, in which -naabe, cognate with Lenape, means "man" or "male"). Alternately, lënu may be translated as "man." The Lenape, when first encountered by Europeans, were a loose association of related peoples who spoke similar languages and shared familial bonds in an area known as Lenapehoking, the Lenape traditional territory, which spanned what is now eastern Pennsylvania, New Jersey, southern New York, and eastern Delaware. 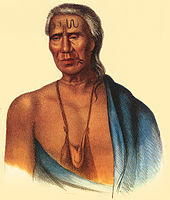 The tribe's common name Delaware is not of Native American origin. English colonists named the Delaware River for the first governor of the Province of Virginia, Thomas West, 3rd Baron De La Warr, whose title was ultimately derived from French. (For etymology of the surname, see Earl De La Warr§Etymology.) The English then began to call the Lenape the Delaware Indians because of where they lived. Swedes also settled in the area, and early Swedish sources listed the Lenape as the Renappi. Traditional Lenape lands, the Lenapehoking, was a large territory that encompassed the Delaware Valley of eastern Pennsylvania and New Jersey from the north bank Lehigh River along the west bank Delaware then south into Delaware and the Delaware Bay. Their lands also extended west from western Long Island and New York Bay, across the Lower Hudson Valley in New York into the lower Catskills and a sliver of the upper edge of the North Branch Susquehanna River. On the west side, the Lenape lived in numerous small towns along the rivers and streams that fed the waterways, and likely shared the hunting territory of the Schuylkill River watershed with the rival Iroquoian Susquehannock. The Unami and Munsee languages belong to the Eastern Algonquian language group. Although the Unami and Munsee speakers people are related, they consider themselves as distinct, as they used different words and lived on opposite sides of the Kitatinny Mountains of modern New Jersey. [original research?] Today, only elders speak the language although some young Lenape youth and adults learn the ancient language. The German and English-speaking Moravian missionary John Heckewelder wrote: "The Monsey tong [sic] is quite different even though [it and Lenape] came out of one parent language." William Penn, who first met the Lenape in 1682, stated that the Unami used the following words: "mother" was anna, "brother" was isseemus, "friend" was netap. Penn instructed his fellow Englishmen: "If one asks them for anything they have not, they will answer, mattá ne hattá, which to translate is, 'not I have,' instead of 'I have not.'" At the time of first European contact, a Lenape person would have identified primarily with his or her immediate family and clan, friends, and/or village unit; then with surrounding and familiar village units. Next with more distant neighbors who spoke the same dialect; and ultimately, with all those in the surrounding area who spoke mutually comprehensible languages, including the Nanticoke people, who lived to their south and west in present western Delaware and eastern Maryland, and the Munsee, who lived to their north. Among many Algonquian peoples along the East Coast, the Lenape were considered the "grandfathers" from whom other Algonquian-speaking peoples originated. Lenape kinship system has matrilineal clans, that is, children belong to their mother's clan, from which they gain social status and identity. The mother's eldest brother was more significant as a mentor to the male children than was their father, who was generally of another clan. Hereditary leadership passed through the maternal line, and women elders could remove leaders of whom they disapproved. Agricultural land was managed by women and allotted according to the subsistence needs of their extended families. Families were matrilocal; newlywed couples would live with the bride's family, where her mother and sisters could also assist her with her growing family. By 1682, when William Penn arrived to his American commonwealth, the Lenape had been so reduced by disease, famine, and war that the sub-clan mothers had reluctantly resolved to consolidate their families into the main clan family. This is why William Penn and all those after him believed that the Lenape clans had always only had three divisions (Turtle, Turkey, and Wolf) when, in fact, they had over thirty on the eve of European contact. Susie Elkhair (d. 1926) of the Delaware Tribe of Indians, wearing ribbonwork shawl. Members of each clan were found throughout Lenape territory and clan lineage was traced through the mother. While clan mothers controlled the land, the houses, and the families, the clan fathers provided the meat, cleared the fields, built the houses, and protected the clan. Upon reaching adulthood, a Lenape male would marry outside of his clan, a practice known by ethnographers as, "exogamy". The practice effectively prevented inbreeding, even among individuals whose kinship was obscure or unknown. This means that a male from the Turkey Clan was expected to marry a female from either the Turtle or Wolf clans. His children, however, would not belong to the Turkey Clan, but to the mother's clan. As such, a person's mother's brothers (the person's matrilineal uncles) played a large role in his or her life as they shared the same clan lineage. As in the case of the Iroquois and Susquehannocks, the animosity of differences and competitions spanned many generations, and in general tribes with each of the different language groups became traditional enemies in the areas they'd meet. On the other hand, The New American Book of Indians points out that competition, trade, and wary relations were far more common than outright warfare—but both larger societies had traditions of 'proving' (blooding) new (or young) warriors by 'counting coup' on raids into another tribes territories. [b] Ethnicity seems to have mattered little to the Lenape and many other "tribes". Archaeological excavations have found Lenape burials that included identifiably ethnic Iroquois remains interred along with those of Lenape. The two groups were sometimes bitter enemies since before recorded history, but intermarriage occurred — and recent scholarship exists saying that both groups have an oral history suggesting they jointly came east together and displaced the mound builders culture. In addition, both tribes practiced adopting young captives from warfare into their tribes and assimilating them as full tribal members. Iroquoians adopting Lenape (or other peoples) were known to be part of their religious belliefs, the adopted one taking the place in the clan of one killed in warfare. Early European observers may have misinterpreted matrilineal Lenape cultural practices. For example, a man's maternal uncle (his mother's brother), and not his father, was usually considered to be his closest male relative, since his uncle belonged to his mother's clan and his father belonged to a different one. The maternal uncle played a more prominent role in the lives of his sister's children than did the father—for example likely being the one responsible for educating a young man in weapons craft, martial arts, hunting, and other life skills. Early European chroniclers did not understand this concept. A Lenape band assigned land of their common territory to a particular clan for hunting, fishing, and cultivation. Individual private ownership of land was unknown, as the land belonged to the clan collectively while they inhabited it, but women often had rights to plots for farming. Clans lived in fixed settlements, using the surrounding areas for communal hunting and planting until the land was exhausted. In a practice known as "agricultural shifting," the group then moved to found a new settlement within their territory. Lenape practiced companion planting, in which women cultivated many varieties of the "Three Sisters:" maize, beans, and squash. Men also practiced hunting and the harvesting of seafood. The people were primarily sedentary rather than nomadic; they moved to seasonal campsites for particular purposes such as fishing and hunting. European settlers and traders from the 17th-century colonies of New Netherland and New Sweden traded with the Lenape for agricultural products, mainly maize, in exchange for iron tools. The Lenape also arranged contacts between the Minquas or Susquehannocks and the Dutch and Swedish West India companies to promote the fur trade. The Lenape were major producers of wampum or shell beads, which they traditionally used for ritual purposes and as ornaments. After the Dutch arrival, they began to exchange wampum for beaver furs provided by Iroquoian-speaking Susquehannock and other Minquas. They exchanged these furs for Dutch and, from the late 1630s, also Swedish imports. Relations between some Lenape and Minqua polities briefly turned sore in the late 1620s and early 1630s, but were relatively peaceful most of the time. The Lenape practiced large-scale agriculture to augment a mobile hunter-gatherer society in the regions around the Delaware River. The Lenape were largely a sedentary people who occupied campsites seasonally, which gave them relatively easy access to the small game that inhabited the region: fish, birds, shellfish and deer. They developed sophisticated techniques of hunting and managing their resources. According to Dutch settler Isaac de Rasieres, who observed the Lenape in 1628, the Lenape's primary crop was maize, which they planted in March. They quickly adopted European metal tools for this task. In May, the Lenape planted kidney beans near the maize plants; the latter served as props for the climbing bean vines. They also planted squash, whose broad leaves cut down on weeds and conserved moisture in the soil. The women devoted their summers to field work and harvested the crops in August. Women cultivated varieties of maize, squash and beans, and did most of the fieldwork, processing and cooking of food. The men limited their agricultural labor to clearing the field and breaking the soil. They primarily hunted and fished during the rest of the year. Dutch settler David de Vries, who stayed in the area from 1634 to 1644, described a Lenape hunt in the valley of the Achinigeu-hach (or "Ackingsah-sack," the Hackensack River), in which one hundred or more men stood in a line many paces from each other, beating thigh bones on their palms to drive animals to the river, where they could be killed easily. Other methods of hunting included lassoing and drowning deer, as well as forming a circle around prey and setting the brush on fire. By the time of the arrival of Europeans, the Lenape were cultivating fields of vegetation through the slash and burn technique. This extended the productive life of planted fields. They also harvested vast quantities of fish and shellfish from the bays of the area, and, in southern New Jersey, harvested clams year-round. The success of these methods allowed the tribe to maintain a larger population than nomadic hunter-gatherers could support. Scholars have estimated that at the time of European settlement, there may have been about 15,000 Lenape total in approximately 80 settlement sites around much of the New York City area, alone. In 1524 Lenape in canoes met Giovanni da Verrazzano, the first European explorer to enter New York Harbor. The early European settlers, especially the Dutch and Swedes, were surprised at the Lenape's skill in fashioning clothing from natural materials. In hot weather both men and women wore only loin cloth and skirt respectively, while they used beaver pelts or bear skins to serve as winter mantles. Additionally, both sexes might wear buckskin leggings and moccasins in cold weather. Deer hair, dyed a deep scarlet, was a favorite component of headdresses and breast ornaments for males. The Lenape also adorned themselves with various ornaments made of stone, shell, animal teeth, and claws. 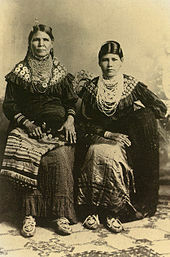 The women often wore headbands of dyed deer hair or wampum. They painted their skin skirts or decorated them with porcupine quills. These skirts were so elaborately appointed that, when seen from a distance, they reminded Dutch settlers of fine European lace. The winter cloaks of the women were striking, fashioned from the iridescent body feathers of wild turkeys. The first recorded European contact with people presumed to have been the Lenape was in 1524. The explorer Giovanni da Verrazzano was greeted by local Lenape who came by canoe, after his ship entered what is now called Lower New York Bay. In the 17th century, Lenape primarily interacted with Dutch traders through the fur trade. The Lenape trapped and traded beaver pelts for European-made goods. At the time of sustained European contact in the 1600s and 1700s the Lenape were a powerful Native American nation who inhabited a region on the mid-Atlantic coast spanning the latitudes of southern Massachusetts to the southern extent of Delaware in what anthropologists call the Northeastern Woodlands. Although never politically unified, the confederation of the Delaware roughly encompassed the area around and between the Delaware and lower Hudson rivers, and included the western part of Long Island in present-day New York. Some of their place names, such as Manhattan ("the island of many hills"), Raritan, and Tappan were adopted by Dutch and English colonists to identify the Lenape people that lived there. Based on the historical record of the mid-17th century, it has been estimated that most Lenape polities consisted of several hundred people but it is conceivable that some had been considerably larger prior to close contact, given the wars between the Susquehannocks and the Iroquois, both of whom were armed by the Dutch fur traders, while the Lenape were at odds with the Dutch and so lost that particular arms race. During the Beaver Wars in the first half of the 17th century, European colonists were careful to keep firearms from the coastally located Delaware, while rival Iroquoian peoples such as the Susquehannocks and Confederation of the Iroquois became comparatively well armed. [c] Subsequently, the Lenape became subjugated and made tributary to first the Susquehannocks, then the Iroquois, even needing their rivals' (superiors') agreement to initiate treaties such as land sales. Like most tribes, Lenape communities were weakened by newly introduced diseases originating in Europe, mainly smallpox but also cholera, influenza and dysentery, and recurrent violent racial conflict with Europeans. Iroquoian peoples occasionally fought the Lenape. As the 18th century progressed, many surviving Lenape moved west—into the (relatively empty)[d] upper Ohio River basin. Smallpox devastated Native American communities even located far from European settlements by the 1640s. The Lenape and Susquehannocks fought a war in the middle of the 17th century that left the Delaware a tributary state even as the Susquehannocks had defeated the Province of Maryland between 1642-50s. New Amsterdam was founded in 1624 by the Dutch in what would later become New York City. Dutch settlers also founded a colony at present-day Lewes, Delaware on June 3, 1631 and named it Zwaanendael (Swan Valley). The colony had a short life, as in 1632 a local band of Lenape killed the 32 Dutch settlers after a misunderstanding escalated over Lenape defacement of the insignia of the Dutch West India Company. In 1634, the Iroquoian-speaking Susquehannock went to war with the Lenape over access to trade with the Dutch at New Amsterdam. They defeated the Lenape, and some scholars believe that the Lenape may have become tributaries to the Susquehannock. After the warfare, the Lenape referred to the Susquehannock as "uncles." The Iroquois added the Lenape to the Covenant Chain in 1676; the Lenape were tributary to the Five Nations (later Six) until 1753, shortly before the outbreak of the French and Indian War (a part of the Seven Years' War in Europe). The Lenape's quick adoption of trade goods, and their need to trap furs to meet high European demand, resulted in their disastrous over-harvesting of the beaver population in the lower Hudson Valley. With the fur sources exhausted, the Dutch shifted their operations to present-day upstate New York. The Lenape who produced wampum in the vicinity of Manhattan Island temporarily forestalled the negative effects of the decline in trade. Lenape population fell sharply during this period, due to high fatalities from epidemics of infectious diseases carried by Europeans, such as measles and smallpox, to which they had no natural immunity, as the diseases had arisen on the Asian continent and moved west into Europe, where they had become endemic in the cities. The Lenape had a culture in which the clan and family controlled property. Europeans often tried to contract for land with the tribal chiefs, confusing their culture with that of neighboring tribes such as the Iroquois. The Lenape would petition for grievances on the basis that not all their families had been recognized in the transaction (not that they wanted to "share" the land). After the Dutch arrival in the 1620s, the Lenape were successful in restricting Dutch settlement until the 1660s to Pavonia in present-day Jersey City along the Hudson. The Dutch finally established a garrison at Bergen, which allowed settlement west of the Hudson within the province of New Netherland. This land was purchased from the Lenape after the fact. In 1682, William Penn and Quaker colonists created the English colony of Pennsylvania beginning at the lower Delaware River. A peace treaty was negotiated between the newly arriving English and Lenape at what is now known as Penn Treaty Park. In the decades immediately following, some 20,000 new colonists arrived in the region, putting pressure on Lenape settlements and hunting grounds. Although Penn endeavored to live peaceably with the Lenape and to create a colony that would do the same, he also expected his authority and that of the colonial government to take precedence. His new colony effectively displaced many Lenape and forced others to adapt to new cultural demands. Penn gained a reputation for benevolence and tolerance, but his efforts resulted in more effective colonization of the ancestral Lenape homeland than previous ones. William Penn died in 1718. His heirs, John and Thomas Penn, and their agents were running the colony, and had abandoned many of the elder Penn's practices. Trying to raise money, they contemplated ways to sell Lenape land to colonial settlers. The resulting scheme culminated in the so-called Walking Purchase. In the mid-1730s, colonial administrators produced a draft of a land deed dating to the 1680s. William Penn had approached several leaders of Lenape polities in the lower Delaware to discuss land sales further north. Since the land in question did not belong to their polities, the talks came to nothing. But colonial administrators had prepared the draft that resurfaced in the 1730s. The Penns and their supporters tried to present this draft as a legitimate deed. Lenape leaders in the lower Delaware refused to accept it. According to historian Steven Harper, what followed was a "convoluted sequence of deception, fraud, and extortion orchestrated by the Pennsylvania government that is commonly known as the Walking Purchase." In the end, all Lenape who still lived on the Delaware were driven off the remnants of their homeland under threats of violence. Some Lenape polities eventually retaliated by attacking Pennsylvania settlements. When they fought British colonial expansion to a standstill at the height of the Seven Years' War, the British government investigated the causes of Lenape resentment. The British asked William Johnson, Superintendent of Indian Affairs, to lead the investigation. Johnson had become wealthy as a trader and acquired thousands of acres of land in the Mohawk River Valley from the Iroquois Mohawk of New York. Beginning in the 18th century, the Moravian Church established missions among the Lenape. The Moravians required the Christian converts to share their pacifism, as well as to live in a structured and European-style mission village. Moravian pacifism and unwillingness to take loyalty oaths caused conflicts with British authorities, who were seeking aid against the French and their Native American allies during the French and Indian War (Seven Years' War). The Moravians' insistence on Christian Lenapes' abandoning traditional warfare practices alienated mission populations from other Lenape and Native American groups, who revered warriors. The Moravians accompanied Lenape relocations to Ohio and Canada, continuing their missionary work. The Moravian Lenape who settled permanently in Ontario after the American Revolutionary War were sometimes referred to as "Christian Munsee", as they mostly spoke the Munsee branch of the Delaware language. During the French and Indian War, the Lenape initially sided with the French, as they hoped to prevent further British colonial encroachment in their territory. But, such leaders as Teedyuscung in the east and Tamaqua in the vicinity of modern Pittsburgh shifted to building alliances with the English. After the end of the war, however, Anglo-American settlers continued to kill Lenape, often to such an extent that the historian Amy Schutt writes the dead since the wars outnumbered those killed during the war. The Treaty of Easton, signed in 1758 between the Lenape and the Anglo-American colonists, required the Lenape to move westward, out of present-day New York and New Jersey and into Pennsylvania, then Ohio and beyond. Sporadically they continued to raid European-American settlers from far outside the area. In 1763 Bill Hickman, Lenape, warned English colonists in the Juniata River region of an impending attack. Many Lenape joined in Pontiac's War, and were numerous among those Native Americans who besieged Pittsburgh. In April 1763 Teedyuscung was killed when his home was burned. His son Captain Bull responded by attacking settlers from New England who had migrated to the Wyoming Valley of Pennsylvania. The settlers had been sponsored by the Susquehanna Company. 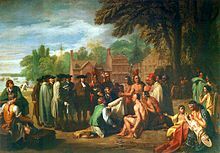 The Lenape were the first Indian tribe to enter into a treaty with the new United States government, with the Treaty of Fort Pitt signed in 1778 during the American Revolutionary War. By then living mostly in the Ohio Country, the Lenape supplied the Continental Army with warriors and scouts in exchange for food supplies and security. After the signing of the Treaty of Easton in 1758, the Lenape were forced to move west out of their original lands into what is today known as Ohio. During the early 1770s, missionaries, including David Zeisberger and John Heckewelder, arrived in the Ohio Country near the Delaware villages. The Moravian Church sent these men to convert the Indigenous peoples to Christianity. The missionaries established several missions, including Gnadenhutten, Lichtenau, and Schoenbrunn. The missionaries pressured Indigenous people to abandon their traditional customs, beliefs, and ways of life, and to replace them with European and Christian ways. Many Lenape did adopt Christianity, but others refused to do so. The Lenape became a divided people during the 1770s, including in Killbuck's family. Killbuck resented his grandfather for allowing the Moravians to remain in the Ohio territory. The Moravians believed in pacifism, and Killbuck believed that every convert to the Moravians deprived the Lenape of a warrior to stop further white settlement of their land. At the time of the American Revolution, the Lenape in Ohio were deeply divided over which side, if any, to take in the war. During this time, the Lenape bands were living in numerous villages around their main village of Coshocton, between the western frontier strongholds of the British and the Patriots. The American colonists had Fort Pitt (present-day Pittsburgh) and the British, along with Indian allies, controlled the area of Fort Detroit (in present-day Michigan). During the French and Indian War, Killbuck had assisted the English against their French enemy. In 1761, Killbuck led an English supply train from Fort Pitt to Fort Sandusky. When The American Revolution began, Killbuck found his people caught between the English in the West and the Americans in the East. At the war's beginning, Killbuck and many Lenape claimed to be neutral. In 1778, Killbuck permitted American soldiers to traverse Delaware territory so that the soldiers could attack Fort Detroit. In return, Killbuck requested that the Americans build a fort near the Natives' major village of Coshocton to provide the Delaware with protection from English attacks. The Americans agreed and built Fort Laurens, which they garrisoned. Other Indian communities, especially the Wyandot, the Mingo, the Munsee, the Shawnee, and the Wolf Clan of the Delaware, favored the British. They believed that by their proclamation of 1763, restricting Anglo-American settlement to east of the Appalachian Mountains, that the British would help them preserve a Native American territory. The British planned to attack Fort Laurens in early 1779 and demanded that the neutral Delawares formally side with the British. Killbuck warned the Americans of the planned attack. His actions helped save the fort, but the Americans abandoned it in August 1779. The Delaware had lost their protectors and, in theory, faced attacks from the British, their native allies, and the American settlers who flooded into the area in the late 1770s and early 1780s after the war. Most Delaware formally joined the British after the American withdrawal from Fort Laurens. Some Lenape decided to take up arms against the American colonials and moved to the west, closer to Detroit, where they settled on the Scioto and Sandusky rivers. Those Lenape sympathetic to the United States remained at Coshocton, and Lenape leaders signed the Treaty of Fort Pitt (1778) with the American colonists. Through this treaty, the Lenape hoped to establish the Ohio territory as a state inhabited exclusively by Native Americans, as a subset of the new United States. A third group of Lenape, many of them converted Christian Munsees, lived in several mission villages run by Moravians. Like the other bands, they also spoke the Munsee branch of Delaware, an Algonquian language. White Eyes, the Lenape chief who had negotiated the treaty, died in 1778. Many Lenape at Coshocton eventually joined the war against the Americans. In response, Colonel Daniel Brodhead led an expedition out of Fort Pitt and on 19 April 1781 destroyed Coshocton. Surviving residents fled to the north. Colonel Brodhead convinced the militia to leave the Lenape at the Moravian mission villages unmolested, since they were unarmed non-combatants. The amateur anthropologist Silas Wood published a book claiming that there were several American Indian tribes that were distinct to Long Island, New York. He collectively called them the Metoac. Modern scientific scholarship has shown that two linguistic groups representing two Algonquian cultural identities lived on the island, not "13 individual tribes" as asserted by Wood. The bands to the west were Lenape. Those to the east were more related culturally to the Algonquian tribes of New England across Long Island Sound, such as the Pequot. Wood (and earlier settlers) often misinterpreted the Indian use of place names for identity as indicating their names for "tribes." Over a period of 176 years, European settlers progressively crowded the Lenape out of the East Coast and Ohio and pressed them to move further west. Most members of the Munsee-language branch of the Lenape left the United States after the British were defeated in the American Revolutionary War. Their descendants live on three Indian reserves in Western Ontario, Canada. They are descendants of those Lenape of Ohio Country who sided with the British during the Revolutionary War. The largest reserve is at Moraviantown, Ontario, where the Turtle Phratry settled in 1792 following the war. Two groups migrated to Oneida County, New York by 1802, the Brotherton Indians of New Jersey and the Stockbridge-Munsee. After 1819, they removed to Wisconsin, under pressure from state and local governments. By the Treaty of St. Mary's, signed October 3, 1818 in St. Mary's, Ohio, the Delaware ceded their lands in Indiana for lands west of the Mississippi and an annuity of $4,000. Over the next few years, the Delaware settled on the James River in Missouri near its confluence with Wilsons Creek, occupying eventually about 40,000 acres (160 km2) of the approximately 2,000,000 acres (8,100 km2) allotted to them. Anderson, Indiana is named after Chief William Anderson, whose father was Swedish. The Delaware Village in Indiana was called Anderson's Town, while the Delaware Village in Missouri on the James River was often called Anderson's Village. The tribes' cabins and cornfields were spread out along the James River and Wilsons Creek. Many Delaware participated in the exploration of the western United States, working as trappers with the mountain men, and as guides and hunters for wagon trains. They served as army guides and scouts in events such as the Second Seminole War, Frémont's expeditions, and the conquest of California during the Mexican–American War. Occasionally, they played surprising roles as Indian allies. Sagundai accompanied one of Frémont's expeditions as one of his Delaware guides. From California, Fremont needed to communicate with Senator Benton. Sagundai volunteered to carry the message through some 2,200 kilometres of hostile territory. He took many scalps in this adventure, including that of a Comanche with a particularly fine horse, who had outrun both Sagundai and the other Comanche. Sagundai was thrown when his horse stepped into a prairie-dog hole, but avoided the Comanche's lance, shot the warrior dead, and caught his horse and escaped the other Comanche. When Sagundai returned to his own people in present-day Kansas, they celebrated his exploits with the last war and scalp dances of their history, which were held at Edwardsville, Kansas. By the terms of the "Treaty of the James Fork" made September 24, 1829, and ratified by the U.S. Senate in 1830, the Delaware were forced to move further west. They were granted lands in Indian Territory in exchange for lands on the James Fork of the White River in Missouri. These lands, in what is now Kansas, were west of the Missouri and north of the Kansas River. The main reserve consisted of about 1,000,000 acres (4,000 km2) with an additional "outlet" strip 10 miles (16 km) wide extending to the west. In 1854 Congress passed the Kansas–Nebraska Act, which created the Territory of Kansas and opened the area for white settlement. It also authorized negotiation with Indian tribes regarding removal. The Delaware were reluctant to negotiate for yet another relocation, but they feared serious trouble with white settlers, and conflict developed. As the Delaware were not considered United States citizens, they had no access to the courts and no way to enforce their property rights. The United States Army was to enforce their rights to reservation land after the Indian Agent had both posted a public notice warning trespassers and served written notice on them, a process generally considered onerous. Major B.F. Robinson, the Indian Agent appointed in 1855, did his best, but could not control the hundreds of white trespassers who stole stock, cut timber, and built houses and squatted on Delaware lands. By 1860 the Delaware had reached consensus to leave Kansas, which was in accord with the government's Indian removal policy. The main body of Lenape arrived in Indian Territory in the 1860s. The two federally recognized tribes of Lenape in Oklahoma are the Delaware Nation, headquartered in Anadarko, Oklahoma, and the Delaware Tribe of Indians, headquartered in Bartlesville, Oklahoma. The Delaware Tribe of Indians were required to purchase land from the reservation of the Cherokee Nation; they made two payments totaling $438,000. A court dispute followed over whether the sale included rights for the Delaware as citizens within the Cherokee Nation. While the dispute was unsettled, the Curtis Act of 1898 dissolved tribal governments and ordered the allotment of communal tribal lands to individual households of members of tribes. After the lands were allotted in 160-acre (650,000 m²) lots to tribal members in 1907, the government sold "surplus" land to non-Indians. The Delaware migrated into Texas in the late 18th and early 19th centuries. Elements of the Delaware migrated from Missouri into Texas around 1820, settling around the Red River and Sabine River. The Delaware were peaceful and shared their territory in Spanish Texas with the Caddo and other immigrating bands, as well as with the Spanish and ever-increasing American population. This peaceful trend continued after Mexico won their independence from Spain in 1821. In 1828, Mexican General Manuel de Mier y Terán made an inspection of eastern Mexican Texas and estimated that the region housed between 150 and 200 Delaware families. The Delaware requested Mier y Terán to issue them land grants and send teachers, so they might learn to read and write the Spanish language. The General, impressed with how well they had adapted to the Mexican culture, sent their request to Mexico City, but the authorities never granted the Delaware any legal titles. The situation changed when the Texas Revolution began in 1835. Texas officials were eager to gain the support of the Texas tribes to their side and offered to recognize their land claims by sending three commissioners to negotiate a treaty. A treaty was agreed upon in February 1836 which mapped the boundaries of Indian lands; but, this agreement was never officially ratified by the Texas government. The Delaware remained friendly after Texas won its independence. Republic of Texas President, Sam Houston favored a policy of peaceful relations with all tribes. He sought the services of the friendly Delaware and in 1837 enlisted several Delaware to protect the frontier from hostile western tribes. Delaware scouts joined with Texas Rangers as they patrolled the western frontier. Houston also tried to get the Delaware land claims recognized but his efforts were only met by opposition. The next Texan President, Mirabeau B. Lamar, completely opposed all Indians. He considered them as illegal intruders who threatened the settlers safety and lands and issued an order for their removal from Texas. The Delaware were sent north of the Red River into Indian Territory, however, a few scattered Delawares remained in Texas. In 1841, Houston was reelected to a second term as president and his peaceful Indian policy was then reinstated. A treaty with the remaining Delaware and a few other tribes was negotiated in 1843 at Fort Bird and the Delaware were enlisted to help him make peace with the Comanche. Delaware scouts and their families were allowed to settle along the Brazos and Bosque rivers in order to influence the Comanche to come to the Texas government for a peace conference. The plan was successful and the Delaware helped bring the Comanches to a treaty council in 1844. In 1845, the Republic of Texas agreed to annexation by the US to become an American State. The Delaware continued their peaceful policy with the Americans and served as interpreters, scouts and diplomats for the US Army and the Indian Bureau. In 1847, John Meusebach was assisted by Jim Shaw (Delaware), in settling the German communities in the Texas Hill Country. For the remainder of his life, Shaw worked as a military scout in West Texas. In 1848, John Conner (Delaware) guided the Chihuahua-El Paso Expedition and was granted a league of land by a special act of the Texas legislature in 1853. The expeditions of the map maker Randolph B. Marcy through West Texas in 1849, 1852, and 1854 were guided by Black Beaver (Delaware). In 1854, despite the history of peaceful relations, the last of the Texas Delaware were moved by the American government to the Brazos Indian Reservation near Graham, Texas. In 1859 the US forced the remaining Delaware to remove from Texas to a location on the Washita River in the vicinity of present Anadarko, Oklahoma. In 1979, the United States Bureau of Indian Affairs revoked the tribal status of the Delaware living among Cherokee in Oklahoma. They began to count the Delaware as Cherokee. The Delaware had this decision overturned in 1996, when they were recognized by the federal government as a separate tribal nation. The Cherokee Nation filed suit to overturn the independent federal recognition of the Delaware. The tribe lost federal recognition in a 2004 court ruling in favor of the Cherokee Nation, but regained it on 28 July 2009. After recognition, the tribe reorganized under the Oklahoma Indian Welfare Act. Members approved a constitution and by laws in a May 26, 2009 vote. Jerry Douglas was elected as tribal chief. In 2004, the Delaware Nation filed suit against Pennsylvania in the United States District Court for the Eastern District of Pennsylvania, seeking to reclaim 315 acres (1.27 km2) included in the 1737 Walking Purchase to build a casino. In the suit titled "The Delaware Nation v. Commonwealth of Pennsylvania" the plaintiffs acting as the successor in interest and political continuation of the Lenni Lenape and of Lenape Chief "Moses" Tundy Tatamy, claimed aboriginal and fee title to the 315 acres of land located in Forks Township in Northampton County, near the town of Tatamy, Pennsylvania. After the Walking Purchase, Chief Tatamy was granted legal permission for him and his family to remain on this parcel of land, known as "Tatamy's Place". In addition to suing the state, the tribe also sued the township, the county and elected officials, including Gov. Ed Rendell. The court held that the justness of the extinguishment of aboriginal title is nonjusticiable, including in the case of fraud. Because the extinguishment occurred prior to the passage of the first Indian Nonintercourse Act in 1790, that Act did not avail the Delaware. As a result, the court granted the Commonwealth's motion to dismiss. In its conclusion the court stated: ... we find that the Delaware Nation's aboriginal rights to Tatamy's Place were extinguished in 1737 and that, later, fee title to the land was granted to Chief Tatamy-not to the tribe as a collectivity. The Lenape who fled United States in the late 18th century settled in what is now Ontario. Canada recognizes three Lenape First Nations with four Indian reserves. They are all located in Southwestern Ontario. Munsee-Delaware Nation, Canadian reserve near St. Thomas, Ontario. Moravian of the Thames First Nation, Canadian reserve near Chatham-Kent. 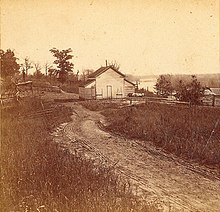 Delaware of Six Nations (at Six Nations of the Grand River), two Canadian reserves near Brantford, Ontario. Three groups who claim descent from Lenape people are state-recognized tribes. More than a dozen organizations in Delaware, Maryland, New Jersey, Virginia, and elsewhere claim descent from Lenape people and are unrecognized tribes. Unrecognized Lenape organizations in Idaho and Kansas have petitioned the United States federal government for recognition. This includes only Lenape documented in history. Contemporary notable Lenape people are listed in the articles for the appropriate tribe. Indian Hannah, aka Hannah Freeman (1730–1802), was said to be the last of the Lenni-Lenape Indians in Chester County, Pennsylvania. Charles Journeycake (1817–1894), Chief of the Wolf Clan from 1855 and principal chief from 1861. Visited Washington, DC 24 times on his tribe's behalf. ^ Zeisberger and Heckewelder lived among the Unami and Munsee people in Pennsylvania and Ohio during the late-18th and early-19th centuries and interviewed them. David Zeisberger wrote A Lenâpé-English Dictionary: From An Anonymous [Manuscript] In The Archives Of The Moravian Church At Bethlehem, [Pennsylvania], David Zeisberger's History of Northern American Indians, The Diary of David Zeisberger: A Moravian Missionary Among the Ohio Indians, Grammar of the Language of the Lenni Lenape or Delaware Indians, and Zeisberger's Indian Dictionary: English, German, Iroquois—The Onondaga and Algonquin—The Delaware. The "Delaware" that Zeisberger translated is Munsee, and not Unami. John Heckewelder wrote extensively on the Lenape in his History, Manners, and Customs of the Indian Nations Who Once Inhabited Pennsylvania and Neighboring States, as well as The Names Which the Lenni Lenape or Delaware Indians Gave to Rivers, Streams, and Localities. ^ One big cultural change occurred during the Beaver Wars—instead of honor raids for bragging rights by stealing cattle, food stocks, weapons, or women, the Iroquois (probably having heard of European wars of conquest) began slash and burn campaigns, often raiding in mid-winter to drive out targeted populations and despoiling their productive lands and food stocks. The Iroquois steamrolled[weasel words] a large variety of tribes of both Algonkian and Iroquoian language groups as they established dominance over a large range, and became the major political factor any English and French decision makers had to consider in making any policy for over a hundred years. Iroquois delegations were hosted and honored in London and Paris. ^ Both the Iroquois and Susquehannocks had trade relations with Europeans and access to extensive river systems hosting beaver colonies—the most coveted furs for Europeans. This gave them access to firearms and made them militarily powerful. For example, over a decade, the Susquehannocks, who'd allied with Swedish Colonists, fought a declared war with the Province of Maryland. By mid-century, they'd subjected the Delaware and so well armed they were much feared by surrounding tribes. ^ The European explorers, traders and missionary penetrating past the Alleghenies in the mid-17th century all report the Ohio Country to be uninhabited, perhaps shared hunting territories. As the Beaver Wars progressed, it is known that Iroquois war parties entered the area, and the confederation later claimed the lands as hunting territories. Why they were empty in the earlier days, if they were instead made empty by the wars or the degree of participation by the Erie Peoples and Susquehannocks (relatives of the Iroquois) is unknown but suspected. ^ "Pocket Pictorial." Archived 2010-04-06 at the Wayback Machine Oklahoma Indian Affairs Commission. 2010: 13. Retrieved 10 June 2010. ^ "Art on the Prairies: Delaware", All About the Shoes. Retrieved 19 July 2011. ^ "Definition of LENAPE". www.merriam-webster.com. Retrieved 2017-07-06. ^ a b c d e f g h i j k l m n o p q r s t Alvin M. Josephy, Jr., ed. (1961). The American Heritage Book of Indians. American Heritage Publishing Co., Inc. pp. 180–211. LCCN 61-14871. ^ "The Lenape-English Dictionary." Gilwell. 18 Oct 2000. Retrieved 2 Dec 2013. ^ a b "Lenape Talking Dictionary." Delaware Tribe of Indians. Retrieved 2 Dec 2013. ^ "Our Tribal History..." www.nanticoke-lenape.info. Retrieved 14 April 2018. ^ Utz, Axel (2011). Cultural exchange, imperialist violence, and pious missions: Local perspectives from Tanjavur and Lenape country, 1720–1760 (Ph.D. thesis). Pennsylvania State University. pp. 140–147. ^ Stevenson W. Fletcher, Pennsylvania Agriculture and Country Life 1640–1840 (Harrisburg: Pennsylvania Historical and Museum Commission, 1950), 2, 35–37, 63–65, 124. ^ Russell, Emily W.B. "Indian Set Fires in the Forests of the Northeastern United States." Ecology, Vol. 64, #1 (Feb): 78 88. 1983a Author found no strong evidence that Indians purposely burned large areas, but they did burn small areas near their habitation sites. Noted that the Lenna Lenape Tribe used fire. ^ A Brief Description of New York, Formerly Called New Netherlands with the Places Thereunto Adjoining, Likewise a Brief Relation of the Customs of the Indians There, New York, NY: William Gowans. 1670. Reprinted in 1937 by the Facsimile Text Society, Columbia University Press, New York. Notes that the Lenni Lenape (Delaware) tribe in New Jersey used fire in ecosystems. ^ Smithsonian Institution—Handbook of North American Indians series: Handbook of North American Indians, Volume 15—Northeast. Bruce G. Trigger (volume editor). Washington, DC: Smithsonian Institution. 1978 References to Indian burning for the Eastern Algonquians, Virginia Algonquians, Northern Iroquois, Huron, Mahican, and Delaware Tribes and peoples. ^ Trigger, Bruce C. (1978). Sturtevant, William C. (ed.). Handbook of North American Indians (general ed.). Washington, DC: Smithsonian Institution. ^ Otto, Paul, 91 The Dutch-Munsee Encounter in America: The Struggle for Sovereignty in the Hudson Valley. New York: Berghahn Press, 2006. ^ a b William Christie MacLeod. "The Family Hunting Territory and Lenape Political Organization," American Anthropologist 24. ^ a b Harper, Steven Craig (2006). Promised Land: Penn's Holy Experiment, the Walking Purchase, and the dispossession of Delawares, 1600–1763. Bethlehem, PA.
^ Keenan, Encyclopedia of American Indian Wars, 1492–1890, 1999, p. 234; Moore, The Northwest Under Three Flags, 1635–1796, 1900, p. 151. ^ Bragdon, Kathleen. The Columbia Guide to American Indians of the Northeast,Columbia University Press (2002). ISBN 978-0-231-11452-3. ^ William E. Connelley. A Standard History of Kansas and Kansans, Vol. I. Chicago: Lewis Publishing Co., 1918, p. 250. ^ "9 Indian Claims Commission 346" (PDF). okstate.edu. Retrieved 14 April 2018. ^ "12 Indian Claims Commission 404" (PDF). okstate.edu. Retrieved 14 April 2018. ^ a b "Delaware Tribe regains federal recognition" NewsOk. 4 Aug 2009. Retrieved 5 August 2009. ^ a b c d Carol A. Lipscomb, "DELAWARE INDIANS," 'Handbook of Texas Online , accessed July 8, 2012. Published by the Texas State Historical Association. ^ "Delaware Indians may use land donated by couple as burial ground". Pittsburgh Post-Gazette. Associated Press. September 19, 2000. p. B-10. Retrieved April 14, 2018. ^ a b "Tribal Directory: D". National Congress of American Indians. Retrieved 28 December 2017. ^ "Tribal Directory". National Congress of American Indians. Retrieved 28 December 2017. ^ "Removal History of the Delaware Tribe". Delaware Tribe of Indians. Retrieved 28 December 2017. ^ a b c "Tribal Directory: Lenape". National Congress of American Indians. Retrieved 14 July 2018. ^ "Petitions for Federal Recognition." 500 Nations. Retrieved 22 Jan 2012. Aberg, Alf. The People of New Sweden: Our Colony on the Delaware River, 1638-1655. (Natur & Kultur, 1988). ISBN 91-27-01909-8. Acrelius, Israel. (Translated from Swedish with an introduction and notes by W.M. Reynolds). A History of New Sweden; or, the Settlements on the River Delaware. Ulan Press, 2011. ASIN B009SMVNPW. Bierhorst, John. Mythology of the Lenape: Guide and Texts. University of Arizona Press, 1995. ISBN 978-0-8165-1573-8. Brinton, Daniel G., C.F. Denke, and Albert Anthony. A Lenâpé - English Dictionary. Biblio Bazaar, 2009. ISBN 978-1-103-14922-3. Burrows, Edward G. and Mike. Wallace. Gotham: A History of New York City to 1989. Oxford: Oxford University Press, 1999. ISBN 0-19-514049-4. Carman, Alan, E. Footprints in Time: A History and Ethnology of The Lenape-Delaware Indian Culture. Trafford Publishing, 2013. ISBN 978-1-4669-0742-3. Dalton, Anne. The Lenape of Pennsylvania, New Jersey, New York, Delaware, Wisconsin, Oklahoma, and Ontario (The Library of Native Americans). Powerkids Publishing, 2005. ISBN 978-1-4042-2872-6. De Valinger, Leon, Jr. and C.A. Weslager. Indian Land Sales In Delaware: And A Discussion Of The Family Hunting Territory Question In Delaware. Literary Licensing LLC, 2013. ISBN 978-1-258-62207-7. Donehoo, George P. A History of the Indian Villages and Place Names in Pennsylvania. Wennawoods Publishing, 1997. ISBN 978-1-889037-11-0. Dreibelbis, Dana E., "The Use of Microstructural Growth Patterns of Mercenaria Mercenaria to Determine the Prehistoric Seasons of Harvest at Tuckerton Midden, Tuckerton, New Jersey," pp. 33, thesis, Princeton University, 1978. Frantz, Donald G. and Norma Jean Russell. Blackfoot Dictionary of Stems, Roots, and Affixes. University of Toronto Press, 1995. ISBN 978-0-8020-7136-1. Fur, Gunglong. A Nation of Women: Gender and Colonial Encounters Among the Delaware Indians (Early American Studies). University of Pennsylvania Press, 2012. ISBN 978-0-8122-2205-0. Goddard, Ives (1978). "Delaware". In Trigger, Bruce G. (ed.). Handbook of North American Indians. vol. 15: Northeast. Washington. pp. 213–239. Grumet, Robert S. The Lenapes (Indians of North America). Chelsea House Publishing, 1989. ISBN 978-0-7910-0385-5. Harrington, Mark. A Preliminary Sketch of Lenape Culture. New Era Printing Company, 1913. ASIN B0008C0OBU. Harrington, Mark. Religion and Ceremonies of the Lenape. Forgotten Books, 2012. ASIN B008J7N986. Harrington, Mark R. Vestiges of Material Culture Among the Canadian Delawares. New Era Printing Company, 1908. ASIN B0008AV2JU. Harrington, Mark R. The Indians of New Jersey: Dickon Among the Lenapes. Rutgers University Press, 1963. ISBN 978-0-8135-0425-4. Heckewelder, John G.E. The History, Manners, and Customs of the Indian Nations Who Once Inhabited Pennsylvania and Neighboring States. Uhlan Publishing, 2012. ASIN B009UTU6LK. Heckewelder, John G.E. Names Which the Lenni Lenape or Delaware Indians Gave to Rivers, Streams, and Localities (Classic Reprint). Forgotten Books, 2012. ISBN 978-1-4400-5862-2. Hoffecker, Carol E., Richard Waldron, Lorraine E. Williams, and Barbara E. Benson (editors). New Sweden in America. University of Delaware Press, 1995. Jennings, Francis. Empire of Fortune. W. W. Norton and Company, 1990. ISBN 978-0-393-30640-8. Jennings, Francis. The Ambiguous Iroquois Empire. W. W. Norton and Company, 1990. ISBN 978-0-393-30302-5. Jennings, Francis. The History and Culture of Iroquois Diplomacy: An Interdisciplinary Guide to the Treaties of the Six Nations and Their League. Syracuse University Press, 1995. ISBN 978-0-8156-2650-3. Johnson, Amandus. The Swedish Settlements on the Delaware: Their History and Relation to the Indians, Dutch and English, 1638-1664 : With an Account of the South, the New Sweden Company, and the American Companies, and the Efforts of Sweden to Regain the Colony. University of Pennsylvania, 1911. ASIN B000KJFFCY. Kalter, Susan (editor). Benjamin Franklin, Pennsylvania, and the First Nations: The Treaties of 1736-62. University of Illinois Press, 2006. ISBN 978-0-252-03035-2. Kraft, Herbert. The Lenape-Delaware Indian Heritage, 10,000 BC to AD 2000. Lenape Books, 2001. ISBN 978-0-935137-03-3. Kurlansky, Mark. The Big Oyster: History on the Half Shell. Random House Trade Paperbacks, 2007. ISBN 978-0-345-47639-5. Lindestrom, Peter. (Transcribed and edited by Amandus Johnson of the Swedish Colonial Society, Philadelphia, Pennsylvania). Geographia Americae: With an Account of the Delaware Indians, Based on Surveys and Notes made in 1654-1656 by Peter Lindestrom. Arno Press, 1979. ISBN 978-0-405-11648-3. Marsh, Dawn G. A Lenape Among the Quakers: The Life of Hannah Freeman. University of Nebraska Press, 2014. ISBN 978-0-8032-4840-3. Middleton, Sam (Chief Mountain, "Neen Ees To-ko). Blackfoot Confederacy, Ancient and Modern. Kainai Chieftainship, 1951. Mitchell, S. H. Internet Archive The Indian Chief, Journeycake. Philadelphia: American Baptist Publication Society, 1895. Myers, Albert Cook. William Penn's Own Account of the Lenni Lenape or Delaware Indians. Middle Atlantic Press, 1981. ISBN 978-0-912608-13-6. Myers, Albert Cook (editor). Narratives of Early Pennsylvania, West New Jersey and Delaware, 1630-1707. Nabu Press, 2012. ISBN 978-1-279-95624-3. Newcomb, William W. The Culture and Acculturation of the Delaware Indians. University of Michigan, 1956. ASIN B0007EFEXW. Newman, Andrew. On Records: Delaware Indians, Colonists, and the Media of History and Memory. Lincoln: University of Nebraska Press, 2012. ISBN 978-0-8032-3986-9. Olmstead, Earl P. Blackcoats Among the Delaware: David Zeisberger on the Ohio Frontier. Kent State University Press, 1991. ISBN 978-0-87338-434-6. Repsher, Donald R. "Indian Place Names in Bucks County." As cited in http://www.lenapenation.org/main.html. Retrieved March 15, 2012. Rice, Phillip W. English-Lenape Dictionary. N.P., N.D. See http://www.lenapenation.org/main.html. Schutt, Amy C. Peoples of the River Valleys: The Odyssey of the Delaware Indians (Early American Studies). University of Pennsylvania Press, 2007. ISBN 978-0-8122-2024-7. Soderlund, Jean R. Lenape Country: Delaware Valley Society before William Penn. Philadelphia: University of Pennsylvania Press, 2014. Spady, James. "Colonialism and the Discursive Antecedents of Penn's Treaty with the Indians". Daniel K. Richter and William A. Pencak, eds. Friends and Enemies in Penn's Woods: Indians, Colonists, and the Racial Construction of Pennsylvania. Pennsylvania State University Press, 2004: 18–40. Trowbridge, C.C. Delaware Indian Language of 1824 (American Language Reprints Supplement Series; edited by James A. Rementer). Evolution Publications and Manufacturing, 2011. ISBN 978-1-935228-06-6. Van Doren, Carl, and Julian P. Boyd. Indian Treaties Printed by Benjamin Franklin, 1736-1762. Nabu Press, 2011. ISBN 978-1-178-59363-1. Vansina, Jan. Oral Tradition as History. Oxford, 1985. ISBN 0-85255-007-3. Wallace, Paul, A.W. Indians in Pennsylvania (Revised Edition). Pennsylvania Historical and Museum Commission, 2000. ISBN 978-0-89271-017-1. Wallace, Paul, A.W. Indian Paths of Pennsylvania. Pennsylvania Historical and Museum Commission, 1998. ISBN 978-0-89271-090-4. Weslager, Clinton, Alfred (C.A). A Brief Account of the Indians of Delaware. Literary Licensing, LLC, 2012. ISBN 978-1-258-23895-7. Weslager, C.A. A Man and His Ship: Peter Minuit and the Kalmar Nyckel. Middle Atlantic Press, 1990. ISBN 978-0-9625563-1-9. Weslager, C.A. Delaware's Buried Past: A Story of Archeological Adventure. Rutgers University Press, 1968. ASIN B000KN4Y3G. Weslager, C.A. Delaware's Forgotten Folk: The Story of the Moors and Nanticokes. University of Pennsylvania Press, 2006. ISBN 978-0-8122-1983-8. Weslager, C.A. Delaware's Forgotten River: The Story of the Christina. Hambleton Company, 1947. ASIN B0006D8AEO. Weslager, C.A., and A. R. Dunlap. Dutch Explorers, Traders And Settlers In The Delaware Valley, 1609-1664. Literary Licensing, LLC, 2011. ISBN 978-1-258-17789-8. Weslager, C.A. Magic Medicines of the Indians. Signet, 1974. ASIN B001VIUW08. Weslager, C.A. New Sweden on the Delaware (Middle Atlantic Press, 1988). ISBN 0-912608-65-X. Weslager, C.A. Red Men on the Brandywine (New and Enlarged Edition). Hambleton Company, 1953. ASIN B00EHSFKEC. Weslager, C.A. The Delaware Indians: A History. New Brunswick, NJ: Rutgers University Press, 1972. ISBN 0-8135-0702-2. Weslager, C.A. The Delaware Indian Westward Migration: With the Texts of Two Manuscripts, 1821-22, Responding to General Lewis Cass's Inquiries about Lenape Culture and Language. Middle Atlantic Press, 1978. ISBN 978-0-912608-06-8. Weslager, C.A. The English on the Delaware: 1610-1682. Rutgers University Press, 1967. ISBN 978-0-8135-0548-0. Weslager, C.A. The Nanticoke Indians: A Refugee Tribal Group of Pennsylvania. Pennsylvania Historical and Museum Commission, 1948). ASIN B0007ED7Z4. Weslager, C.A. The Swedes and Dutch at New Castle. Middle Atlantic Press, 1990. ISBN 978-0-912608-50-1. Zeisberger, David. A Lenâpé-English Dictionary: From An Anonymous [Manuscript] In The Archives Of The Moravian Church At Bethlehem, [Pennsylvania]. Nabu Press, 2012. ISBN 978-1-278-79951-3. Zeisberger, David. David Zeisberger's History of Northern American Indians (Classic Reprint). Forgotten Books, 2012. ASIN B008HTRBDK. Zeisberger, David. Grammar of the Language of the Lenni Lenape or Delaware Indians. Forgotten Books, 2012. ASIN B008LQRNGO. Zeisberger, David. The Diary of David Zeisberger: A Moravian Missionary Among the Ohio Indians, Volume 1. Ulan Press, 2012. ASIN B00A6PBD82. Zeisberger, David. The Diary of David Zeisberger: A Moravian Missionary Among the Ohio Indians, Volume 2. Ulan Press, 2012. ASIN B009L4SVN4. Zeisberger, David. Zeisberger's Indian Dictionary: English, German, Iroquois—The Onondaga and Algonquin—The Delaware. Harvard University Press, 1887. ISBN 1-104-25351-8. "The Delaware" that Zeisberger translated was Munsee, and not Unami. Brown, James W. and Rita T. Kohn, eds. Long Journey Home ISBN 978-0-253-34968-2. Indiana University Press (2007). Grumet, Robert Steven (2009). The Munsee Indians: a history. Civilization of the American Indian. 262. Norman: University of Oklahoma Press. ISBN 978-0-8061-4062-9. OCLC 317361732. Kraft, Herbert: The Lenape: Archaeology, History, and Ethnography. New Jersey Historical Society, 1987. ISBN 978-0-911020-14-4. Kraft, Herbert. 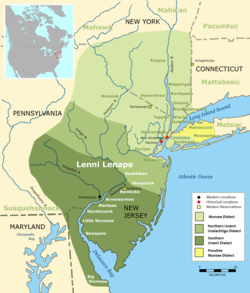 The Lenape or Delaware Indians: The Original People of New Jersey, Southeastern New York State, Eastern Pennsylvania, northern Delaware and parts of western Connecticut. Lenape Books, 1996. ISBN 978-0-935137-01-9. O'Meara, John, Delaware-English / English-Delaware dictionary, Toronto: University of Toronto Press (1996) ISBN 0-8020-0670-1. Pritchard, Evan T., Native New Yorkers: The Legacy of the Algonquin People of New York. Council Oak Books: San Francisco, 2002, 2007. ISBN 1-57178-107-2. Richter, Conrad, The Light In The Forest. New York: 1953. Wikimedia Commons has media related to Lenape. Wikisource has the text of a 1911 Encyclopædia Britannica article about Lenape. "Delaware. One of the most important tribes of Algonquian stock" . New International Encyclopedia. 1905.